Early stopping is a technique that is very often used when training neural networks, as well as with some other iterative machine learning algorithms. The idea is quite intuitive - let us measure the performance of our model on a separate validation dataset during the training iterations. We may then observe that, despite constant score improvements on the training data, the model's performance on the validation dataset would only improve during the first stage of training, reach an optimum at some point and then turn to getting worse with further iterations. It thus seems reasonable to stop training at the point when the minimal validation error is achieved. Training the model any further only leads to overfitting. Right? The reasoning sounds solid and, indeed, early stopping is often claimed to improve generalization in practice. Most people seem to take the benefit of the technique for granted. In this post I would like to introduce some skepticism into this view or at least illustrate that things are not necessarily as obvious as they may seem from the diagram with the two lines above. How does Early Stopping Work? To get a better feeling of what early stopping actually does, let us examine its application to a very simple "machine learning model" - the estimation of the mean. Namely, suppose we are given a sample of 50 points from a normal distribution with unit covariance and we need to estimate the mean of this distribution. 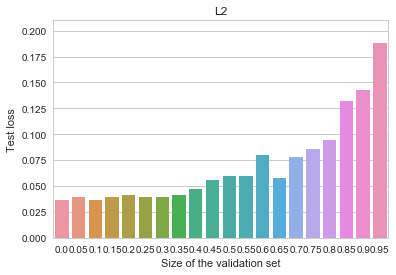 In a sense, the validation function now acts as a kind of a "guardian", preventing the optimization from converging towards the bottom of our main objective. The algorithm is forced to settle on a model, which is neither an optimum of nor of . Moreover, both and use less data than , and are thus inherently a worse representation of the problem altogether. So, by applying early stopping we effectively reduced our training set size, used an even less reliable dataset to abort training, and settled on a solution which is not an optimum of anything at all. Sounds rather stupid, doesn't it? As we see, early stopping greatly increases the variance of the estimate and adds a small bias towards our optimization starting point. 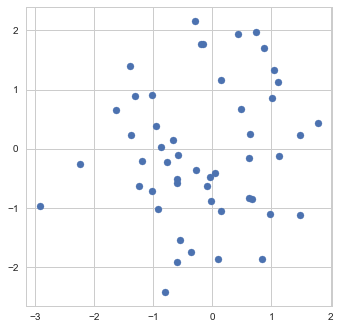 Here the y axis shows the squared distance of the estimated point to the true value (0,0), smaller is better (the dashed line is the expected distance of a randomly picked point from the data). 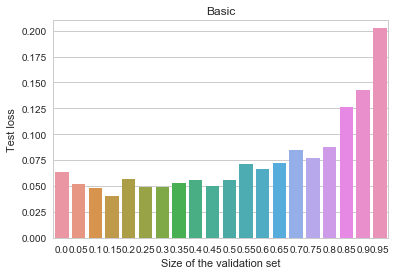 The x axis shows all possible sizes of the validation set. We see that using no early stopping at all (x=0) results in the best expected fit. If we do decide to use early stopping, then for best results we should split the data approximately equally into training and validation sets. Interestingly, there do not seem to be much difference in whether we pick 30%, 50% or 70% of data for the validation set - the validation set seems to play just as much role in the final estimate as the training data. 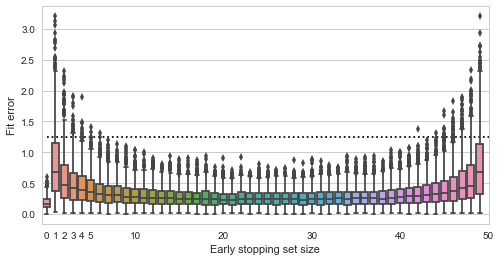 The y axis depicts log-loss on the 10k MNIST test set, the x axis shows the proportion of the 60k MNIST training set set aside for early stopping. Ignoring small random measurement noise, we may observe that using early stopping with about 10% of the training data does seem to convey a benefit. Thus, contrary to our previous primitive example, when the objective is complex, early stopping does work as a regularization method. Why and how does it work here? 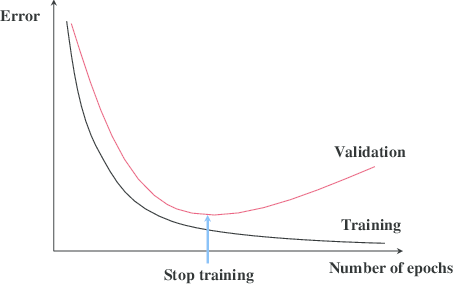 Here's one intuition I find believable (there are alternative possible explanations and measurements, none of which I find too convincing or clear, though): stopping the training early prevents the algorithm from walking too far away from the initial parameter values. This limits the overall space of models and is vaguely analogous to suppressing the norm of the parameter vector. In other words, early stopping resembles an ad-hoc version of regularization. Early stopping is again not useful at all, and the overall model is better than all of our previous attempts. Conclusion: Do We Need Early Stopping? Given the reasoning and the anecdotal experimental evidence above, I personally tend to think that beliefs in the usefulness of early stopping (in the context of neural network training) may be well overrated. Even if it may improve generalization for some nonlinear models, you would most probably achieve the same effect more reliably using other regularization techniques, such as dropout or a simple penalty. Note, though, that there is a difference between early stopping in the context of neural networks and, say, boosting models. 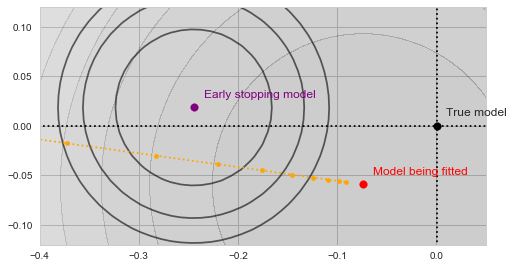 In the latter case early stopping is actually more explicitly limiting the complexity of the final model and, I suspect, might have a much more meaningful effect. At least we can't directly carry over the experimental examples and results in this blog post to that case. Also note, that no matter whether early stopping helps or harms the generalization of the trained model, it is still a useful heuristic as to when to stop a lengthy training process automatically if we simply need results that are good enough. Hey, you biased your representation. Show the graphs when the training set is fixed and you choose the validation set by fetching new elements. This should give you a different dynamics. Do comparison with early stopping and without in this setting. Early stopping is a technique to reduce the bias in training error estimate. Recall that training error estimate does not approximate true loss due to bias from multiple hypothesis testing. In training you effectively test thousands if not millions of distinct hypothesis. As you choose ( or at least try to choose) the hypothesis (model) with lowest observable error estimate you bias the estimate towards zero. 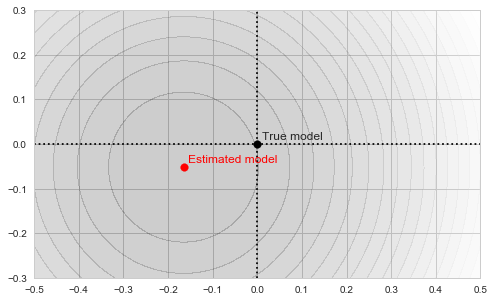 If there are no clear winners in the set of possible models the bias is very significant essentially the number of hypotheses tested in parallel is very large. In the early stopping setting you estimate loss for a single function in each iteration as by fitting you have chosen single function. Thus, for a single iteration you have reduced multiple testing problem to a singe hypothesis testing and your estimate on the overall loss is unbiased. As you do early stopping steps for number of iterations the multiple testing setting creeps in again. By the algorithm design you choose the model with the lowest error on the validation set. 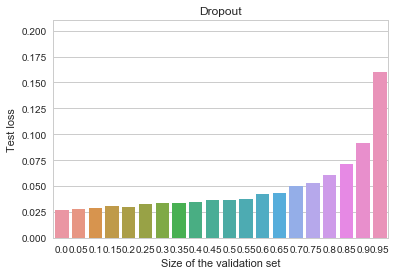 As a result, the error estimate on the validation set is again downward biased. The early stopping strategy makes sense only if the bias on the training set is much larger than for the validation set. 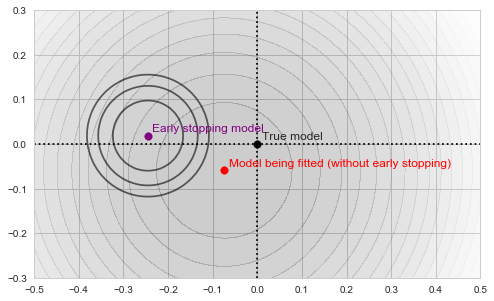 When there are many roughly equal models in the model class say millions and you do hundreds of iteration with early stopping then the training error bias is much larger than validation set bias and early stopping helps you to select better models. To be formally correct and quantify the effects I should introduce a right complexity measure for model classes with infinite number of members but on intuitive level it should be clear what is the effect. By the explanation given above it is clear that the early stopping is useful when training error reaches plateau. Then by construction you are in the setting where you have gazillion almost equivalent models and small drop in training error can be explained by a pure luck. Show the graphs when the training set is fixed and you choose the validation set by fetching new elements. No, I deliberately did not do it. Because in practice there is never a situation where you have a fixed training set and need to choose the size of the validation set. In practice you have a fixed "full" training set and need to decide whether to use a separate validation set, and if so, what must be its size. That is, you must trade off training data for validation. Early stopping is a technique to reduce the bias in training error estimate. Hold-out validation is such a technique. Early stopping is the process of stopping training based on that separate estimate. By the explanation given above it is clear that the early stopping is useful when training error reaches plateau. Well, again, in practice, it rarely is the case. By the time your training error reaches plateau, the validation error is long gone up. Hold-out validation is such a technique. Early stopping is the |process of stopping training based on that separate estimate. Potato-potatoe. You stop early. Why? Because further minimisation of training error is pointless! Why? Because further iterations of training error estimates would be more biased. That is, early stopping makes sense only if it allows you to choose a model with lower loss. This is possible only if the bias (optimism) in training error in next iterations will be bigger than the decrease of training error. Hence, early stopping is a mechanism of reducing training error. Early stopping is successful only if the optimism for the final training error is smaller than the optimism for the final training error without early abort. Well, not really. As you use the validation error to stop training you may not claim it provides an unbiased estimate any more. "Generalization error" you meant. True, it is a "mechanism". The question is whether this is a reasonable mechanism in comparison with any other regularization techniques. validation set by fetching new elements. In many settings sampling a reasonable 100000 element validation set is for free. For example your training set is of order 100 000 000. In such setting removing validation set does not decrease ability to learn. So please stop apologising and show the results for this setting as well. In the (not extremely common) situations when your training set has 100 000 000 elements, you might have no need for extra regularization because your model is not complex enough to overfit all of the data anyway. And if your model is complex enough to be capable of overfitting a 100M dataset, then you are in the same situation as with a 1000-element dataset: do you trust 1% of your data to provide the optimal stopping point, or let 99% have a say in the process? Or, in general, if you want to bias the training process from overfitting, why don't you use "usual" regularization at all. I can't make a meaningful experiment with 100M points at the moment (and doing the "mean estimation" with more data won't change the results there). However, I'll add some perspective on the effect of other regularization methods, following Tanel's remark. I think I see another way to turn your comment into an interesting observation. Why don't we try to include confidence intervals into the early stopping criteria. That is, why not stop not when the difference between validation and training error becomes statistically significant. I think I never saw that being done in practice. Will try and then extend the post if it makes for some interesting results.